It’s almost two years since I first sketched out this drawing. It all began with a coffee at the Pig and Pastry and somehow the word has got around that this is one extraordinary street. Hearing that Bishy Road has been awarded the honour of becoming Britain’s No 1 Great British High Street was such good news today. That’s a huge amount of community effort, dedication and commitment spent over many years, led by Johnny Hayes of Frankie and Johnny’s cookshop and with a whole raft of participation in and beyond this remarkable street. A corner of the Bishy Road on a January morning a few years ago. Congratulations Bishy Road! Enjoy your big moment. You show how it is possible to turn the ordinary into extraordinary. To see the drawings in full, please click over to Drawing the Street or call into Blossom Street Gallery where prints are on sale. Drop me an email at ronnieCruwys@drawingthestreet.co.uk before the weekend if you want to order in time for Christmas. Congratulations Piggies! Plenty going on in every corner. I have been drawn back to the Great North Road, this time up in York. The Roman road from London can be traced closely beneath the present day A64, entering York just a little north of Blossom Street and Micklegate and neatly illustrated on the British History Online website (scroll down on the link site for the map). I mentioned in an earlier post that I went to school in York and Micklegate was my cycle route into town. Of course, much has changed and I see that the first building on the street is now occupied by Bike Shed, hopefully ready to greet the forthcoming Tour de Yorkshire. Brilliant! I will be there in the crowds again this year. 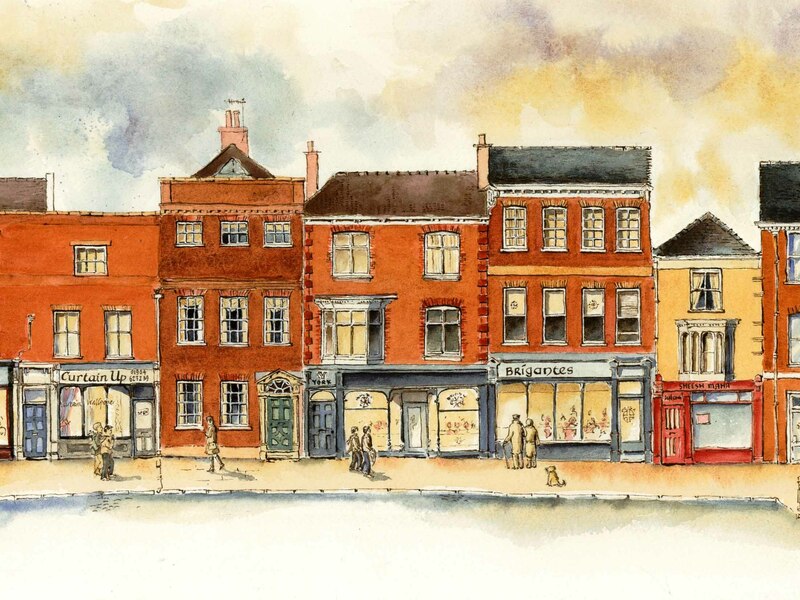 Micklegate is a long street and this drawing is only about a third of one side but I have discovered that there are seven Grade I, 26 Grade II* and 117 Grade II listed buildings in Micklegate alone! Having made a great journey north himself, my father would often speak of the ancient roads in and around the city and how in the past, convicts would have been taken from York Castle prison along Micklegate, then Blossom Street and out along what is now the A64 to Tyburn, on the Knavesmire. Dad had been given a very old book ‘the Criminal Chronology of York Castle‘ which is a register of all those unfortunate souls executed at Tyburn since 1379 with many awful insights into life and death within the city. Dad passed the book on to me and it’s a sobering read. Events don’t seem so long ago when I think that most of these buildings would have been extant on ‘Saturday 6th March 1761, when Ann Richmond, a fine young girl, was executed at Tyburn Without Micklegate Bar, for setting fire to a stack and barn belonging to her mistress’. The buildings on Micklegate would have been some of the last that she saw. I got lost in thought whilst drawing Micklegate. 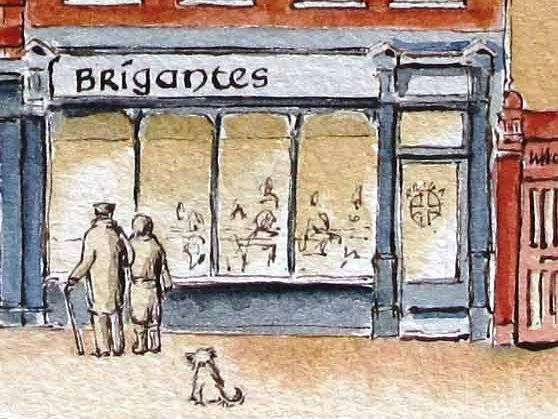 I kept thinking of my parents, John and Mary Sharp (nee O’Donoghue), who lived in York for over 50 years and I took the liberty of drawing them in, looking into Brigantes window – which incidentally is the name of a Celtic Romano tribe – apt for my English dad and Irish mum. Our much loved old Nova Scotia Duck Tolling Retriever Arran is included, no shadows of course! Micklegate holds many names which have gone – the Blake Head is one that I really do miss when I visit York. I don’t like seeing buildings unused so it is great to hear that this is now home to the BlueBird Bakery and the Rattle Owl. With great names like that, I hope they go a long way – best of luck to you! DW hair and Army careers recruitment. The Rattle Owl and Bluebird Bakery in the former Blake Head Bookshop site. I gather from the York Press that ‘Plans have also been submitted to the council to excavate the cellar of the property which is believed to be sitting on top of a Roman road, with hopes of incorporating it into the current building design and allowing it to be displayed.’ Exciting! Look forward to hearing more of this! 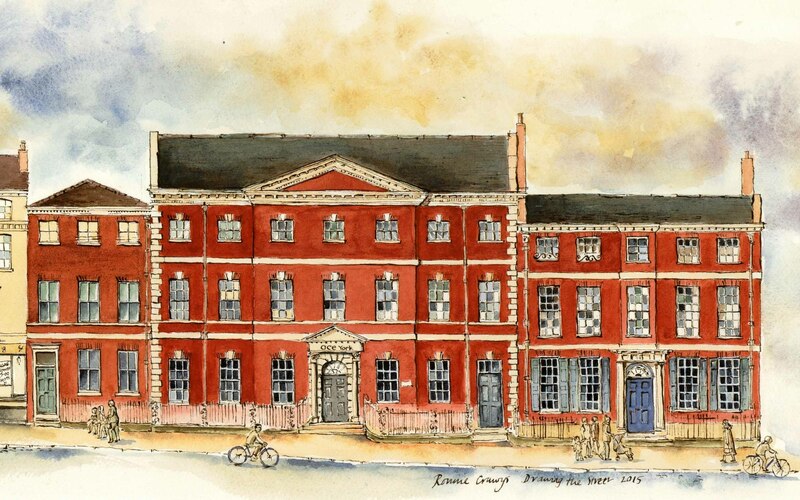 Micklegate House (c1752) below, was the former town house of the Bourchiers of Beningbrough. Limited edition prints will soon be available at Blossom Street Gallery and Framing. Please email me directly and I will happily reserve one for you. A small number will be available to buy from me directly. Our son John was diagnosed with Crohn’s Disease at 14. At the time we had no real idea of what that meant other than the leaflets published by the charity now known as Crohns and Colitis UK and from support by medical staff. John had two operations during his teens to manage symptoms and it gradually dawned on us just how debilitating this illness can be. 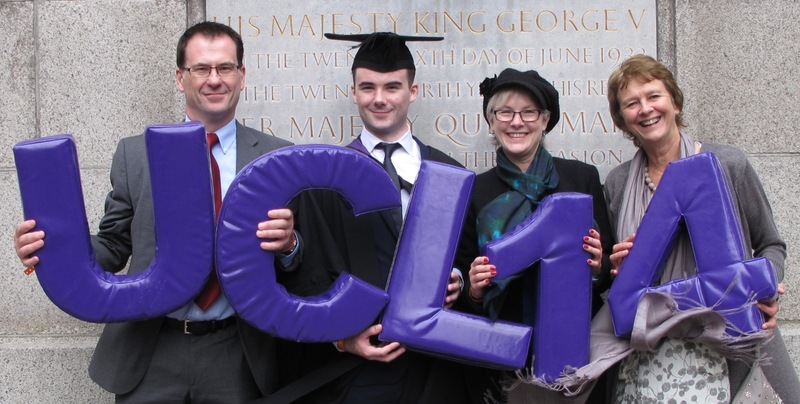 It is an ongoing condition that occurs in painful ‘flare-ups’ but in spite of this, John has dealt with it, gone on to study Architecture at UCL and has just graduated with First Class Honours. We are incredibly proud of him and wish him all the best as he embarks on his year in practice. So, to share our delight at this news, I am donating all proceeds from the framed Bishy Road Limited Edition fine art print 2/199 to Crohn’s and Colitis UK as a small tribute to the courage of youngsters having to deal with this disease. Blossom Street Gallery and Framing have the framed print on display. It is one of 12 large sized signed prints (1.6 m long) and is on sale at £295. Alice Ross of the Blossom Street Gallery, York, displaying the framed Bishy Road picture. Further limited edition fine art giclee signed prints are available to order through myself or Blossom Street Gallery and Framing, York, YO24 1A. The gallery is offering a special 10% discount on framing Bishy Road prints. Unframed print no’s 1 – 12 are 1550mm long (£195 RRP), print no’s 13-100 are 1200mm (£119 unframed) and no’s 101-199 are 600mm (£48). There is a sense of great relief when I complete a street drawing, even more so on completion of a pair. I have spent the best part of 100 hours on each drawing from the early sketches to the drafts, the transfer and then ink then wash on the watercolour paper. With ink, there is no rubbing out mistakes so they get to stay! 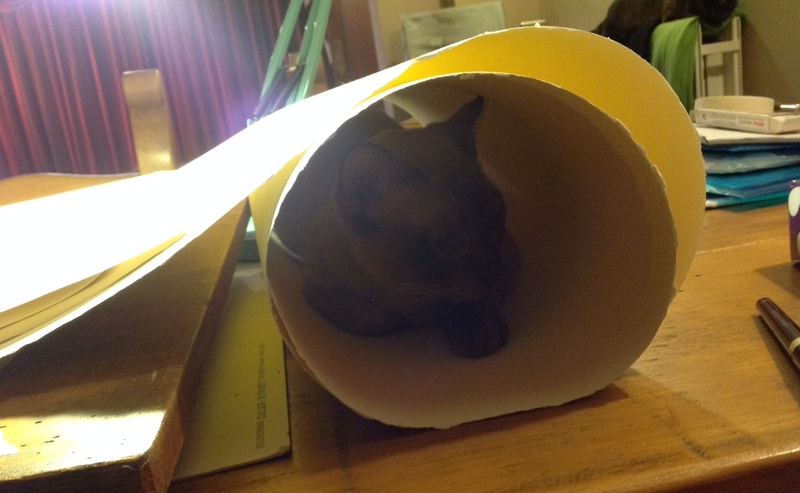 Plus we live with a nervous dog, two Burmese cats and a tortoise which combined can be quite a handful! Yes, I do shut the cats out but Norman can negotiate door handles, walls and windows with ease and he likes to help. So the great Bishy Road is complete. 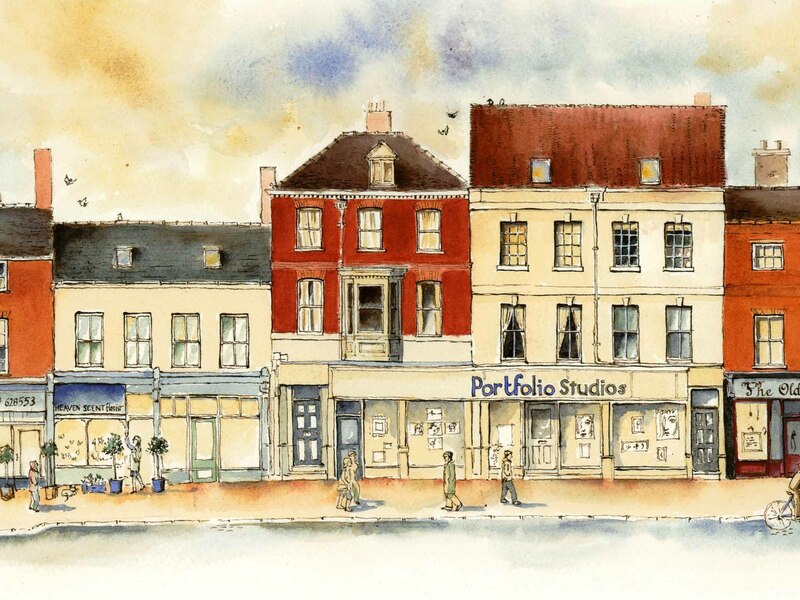 It has been a joy to draw this street – the most interactive and sociable that I have done so far. 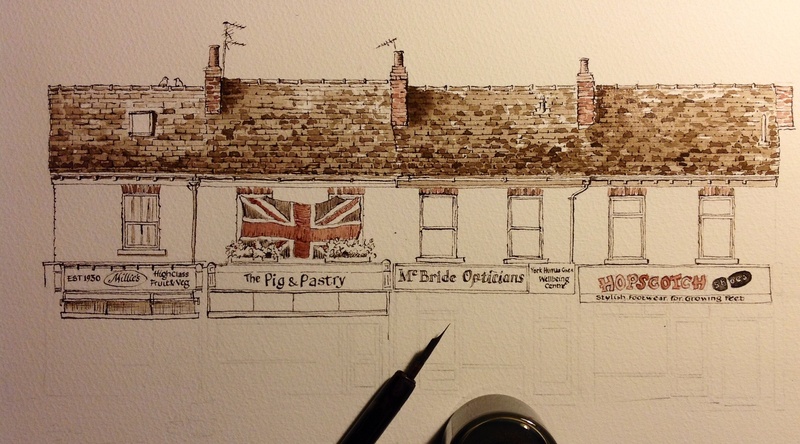 My first contact with the street began last year with elevenses at the Pig and Pastry, where this drawing began. Since then, through connections on social media, I have gradually picked up the great warmth, humour, fun and sense of community spirit on this street from simple acts of kindness such as looking after a lost dog to the generous spirit in fundraising for various charitable causes. People care here. 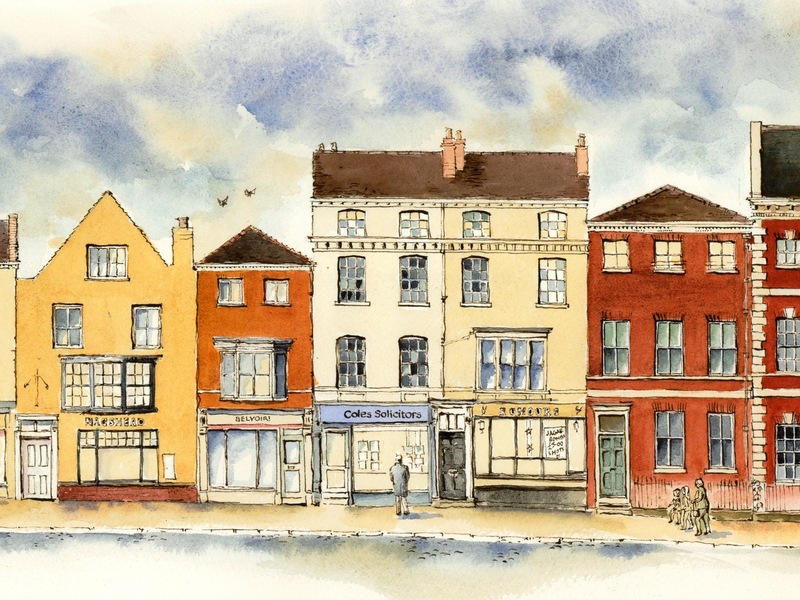 The photographer Karen Turner, has captured the energy of this street beautifully over on her blog – it’s well worth a look. Bishy Road full of life even on a cold January mid-week morning – especially around the Pig and Pastry and Millies! 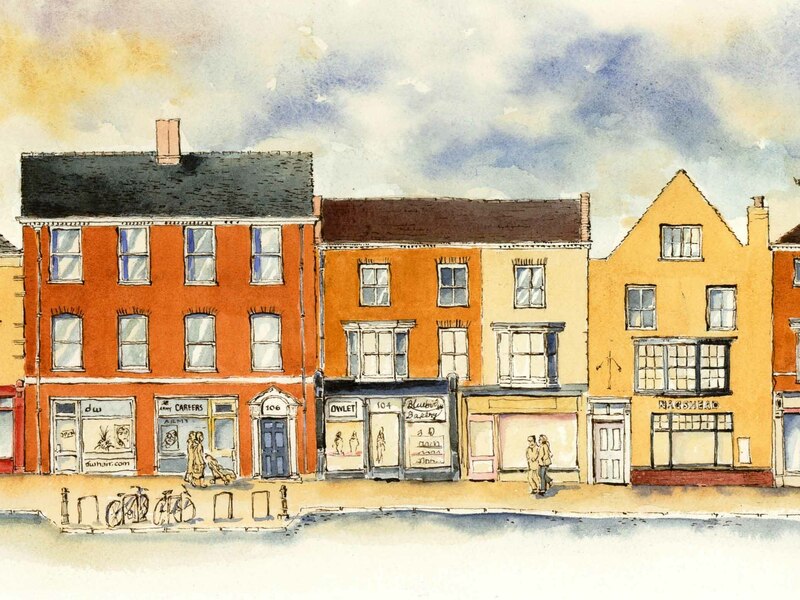 Furthermore, there is a real sense of belonging here which the Clementshall History Group demonstrates through their blog where you can see how several shops have survived with the same use for over 100 years – that is some achievement! As my first drawing reached completion, Bishy Road greeted le Tour de France. 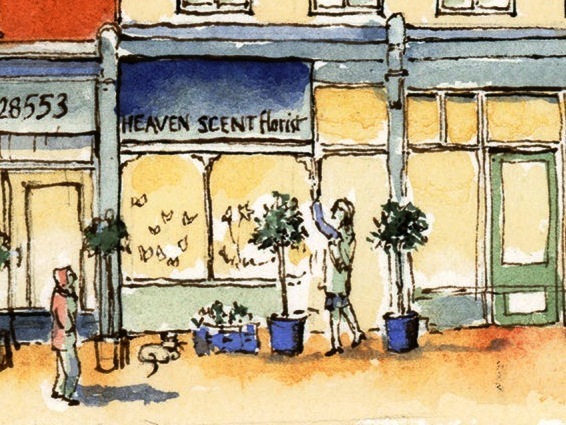 Now, as I wrap up the second drawing, Bishy road have entered the competition for the best Great British High Street. I wish them every success – their sparkle is the result of combined hard work, vision and commitment. 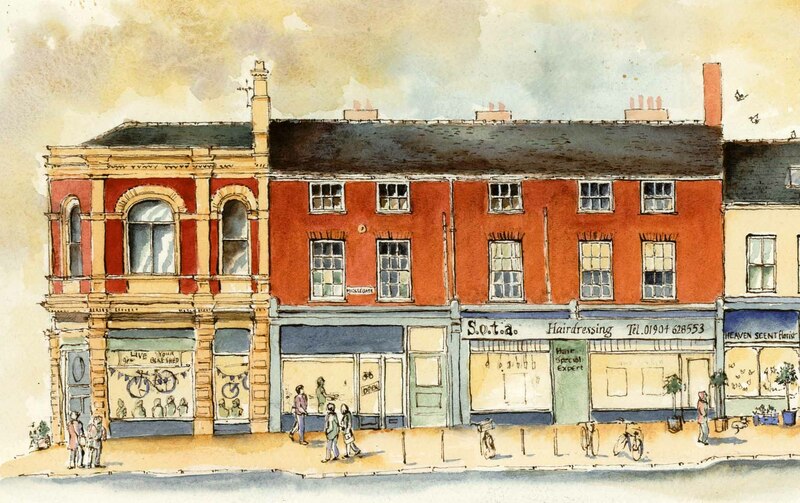 The full length drawings of both sides of Bishy Road are shown on my website Drawing the Street and for detailed views of the buildings, please visit Drawing the Detail. The original drawing is just under 2 metres long and it is not easy to reduce the image down to a phone sized view unless I crop it – hence Drawing the Detail. Limited edition (100 only) signed giclee fine art prints (unframed) will shortly be available for sale, three sizes, 60cm (£48) 1.2m (£119) and 1.5m (£195), through Blossom Street Gallery and Framing, please contact me for further information or to reserve one. Banners are also available by request – please contact me for a quote. Thanks for reading and here’s to you Bishy Road! My earliest memory is being held in my Dad’s arms, travelling on the train from Kings Cross to York in the winter of 1962. I was only two when our whole family moved north from Sittingbourne, Kent, up to Acomb, York. Life has moved us all in varied directions but last year saw us clearing the last of our dear Dad’s belongings from his home. We would get going early on and set ourselves a bookshelf to clear, or a cupboard to sort but it would always be followed by a treat…morning coffee out somewhere and The Pig and Pastry was a regular treat! So after all these years I got to know the Bishy Road. What a community – I had to draw your street! My drawings always begin with an old OS map and this too began with the old OS street maps in York library, then a sketch. I aim to catch all the architectural details as I hope my drawings will stand as an archive of our streetscapes as they stand at present. Pencil sketch of Bishy road – I sketch it all out full length before I work on the final drawing. It is gradually taking shape on a 1.8 metre length of 300gsm water colour paper. For this drawing, I am working in permanent Indian inks: sepia and terracotta and using a mapping pen rather than my usual fixed width Rotring technical pen. It has more variety in the line. Let’s see how it goes! Thanks for reading…oh and I have not forgotten about the south side of the street – that’s up my sleeve.